For a few weeks now, we provide 8 different materials for laser cutting on our online platform, available in various thicknesses and colors. From Metals to Cardboard, our materials offer a wide variety of uses and applications for your laser cutting projects. 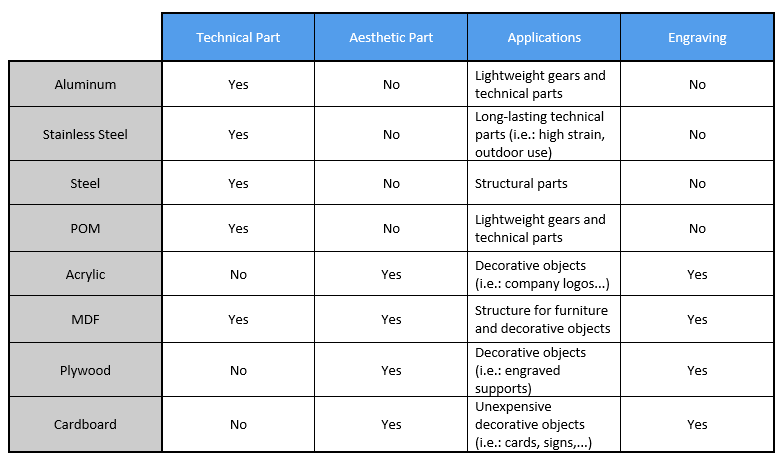 Not all materials are designed for aesthetic uses and, of course, some of them are especially made for technical parts. 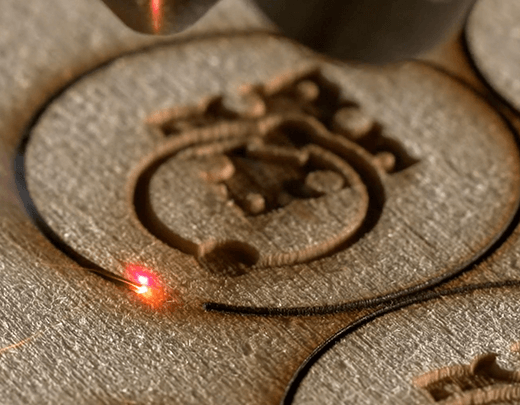 Discover this guide of how to use our laser cutting materials. It will be an opportunity to get familiar with our most recently added laser cut materials: our laser cut metals, aluminum, stainless steel and raw steel. 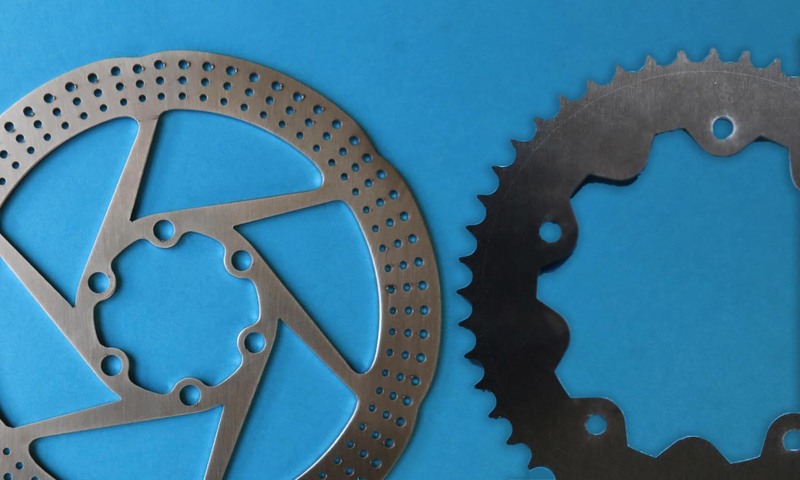 From the time we launched our laser cutting service, our clients expressed a high demand for metal laser cutting. It is now possible to laser cut through our online laser cutting service in aluminum, stainless steel and steel. These metal are very resistant, and ideal for technical, mechanical parts. They are not, however, destined to be used for aesthetic purposes, since they come without any surface finish, and are often marked. 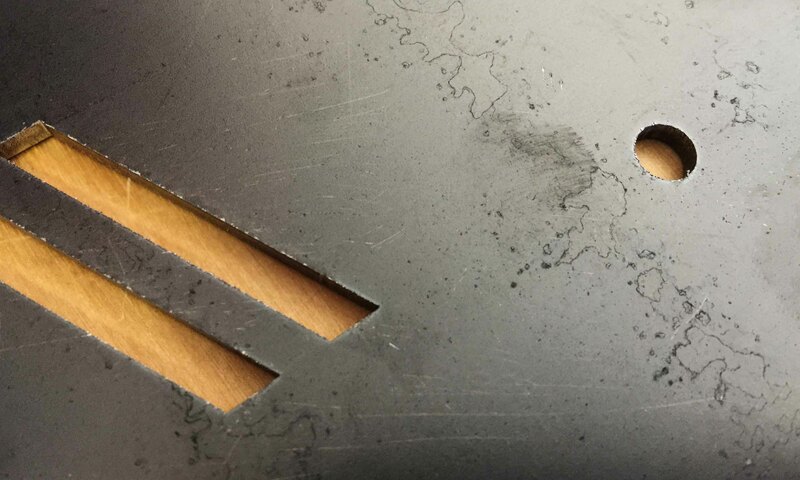 Why these marks on metal laser cut parts? How to avoid these marks? You can limit the marks by avoiding details inside the part, especially details that are smaller than the thickness of the material. The metals on our platform are available in 1 mm, 2 mm or 3 mm. For example, for a stainless steel part made with the thickness of 3 mm, a whole in the part shouldn’t be smaller than 3 mm of diameter. You can also apply an additional surface finish on your parts after receiving them (painting, polishing…). 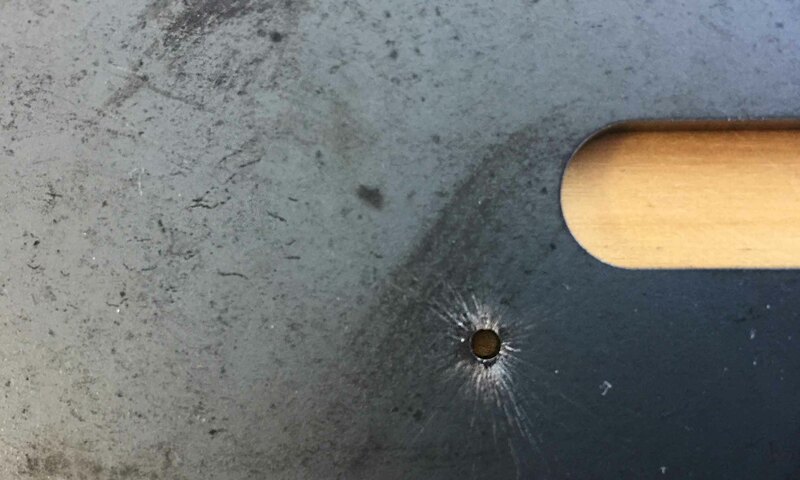 These techniques might not avoid all the marks and stains on your metal laser cut parts, but will reduce them. What about laser engraving metal parts? Laser engraving is the same: it won’t produce an aesthetic result on metal parts. The engraving is very light, and sometimes not very visible. It can be used to mark the parts for later post-processes (machining,…), or to add serial numbers. How to choose between the 3 metal laser cutting options? Aluminum is the metal with the best weight / strength ratio. That means that the aluminum parts are very interesting where weight is a concern. The aspect of the aluminum is shiny but the surface can be scratched and the edges slightly sharp. Remember that in addition to machining possibilities (sawing, drilling, folding…) the aluminum can be sanded, polished, painted and silkscreened to become more aesthetic. We can find applications in transportation, automotive or aerospace industries for cogwheels or gears. At Sculpteo, we used aluminum in the Sculpteo Bike project for the crank and brake discs. You don’t know what is the Sculpteo Bike Project? Visit our blog article on the first digitally manufactured bike! 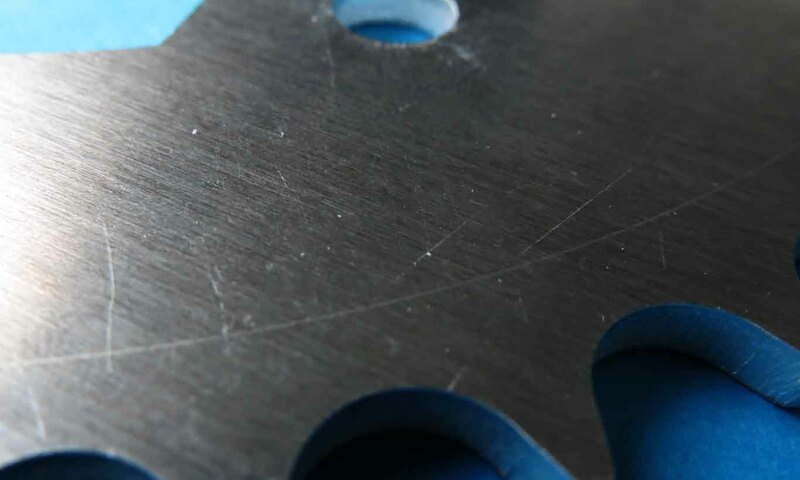 To learn more about the characteristics and uses of the aluminum for laser cutting, you can visit the dedicated material page. This engineering material is strong and has the particularity to resist to corrosion. The mix of steel, nickel and chromium gives to that material the ability to resist to rust and harsh outdoor conditions. The surface of the stainless steel is brushed and slightly shiny. 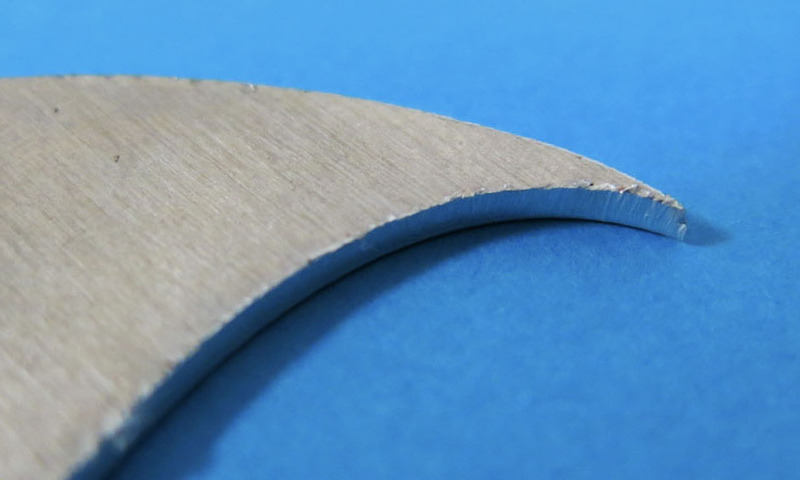 It is often scratched because of manipulations during the cutting process. It can be otherwise machined, sawed, drilled and also painted. To continue, stainless steel is certainly one of the best-known materials among surgeons: it is indeed very easy to clean and to sterilize for hygienic safe uses. However, our stainless steel is not designed for hygienic purposes and is not bio-compatible as it is. Stainless steel was also used on the Sculpteo Bike Project for cogwheels that lead the bicycle chain. If you want to discover the Sculpteo bike project, you can check this article on the first digitally manufactured bike! To learn more about this laser cutting material, you can visit the stainless steel material page. Our S235 Steel (S is for structural) can be used for any structure work and will resist to most of the mechanical and thermal stresses. Steel is darker than our two other materials and is the roughest one. Its surface can be scratched and tints very irregular. However, Steel is can be easily painted and covered to both protect it and improve its aesthetic aspect. Among its applications, we can think of the architecture and building industry, but also into cars for structures. To learn more about the capacities of the steel material for laser cutting, read our material page. Before laser cutting metals, we launched a unique and engineering material: POM, also called Delrin. 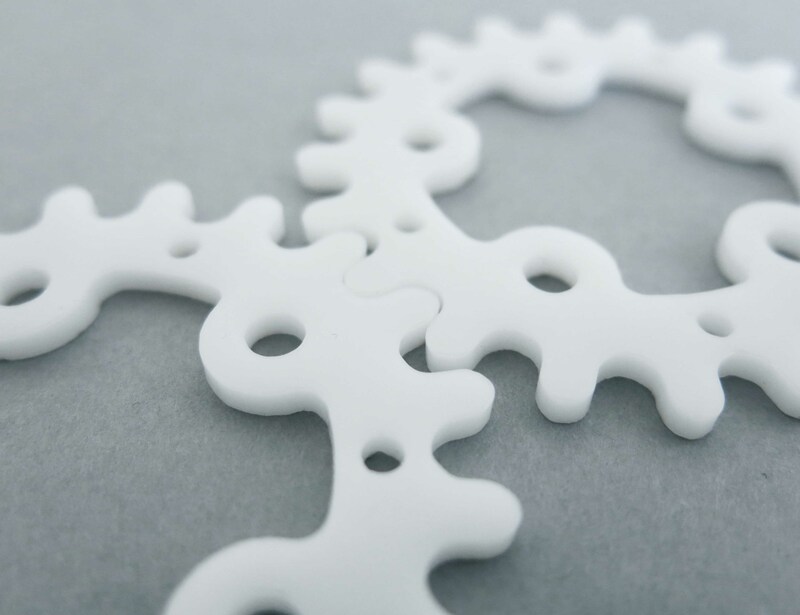 This engineering thermoplastic was our first laser cutting material entirely dedicated to technical uses. POM can endure large amounts of strain and friction. It is very resistant and experiences very little shrinkage. Moreover, POM is weatherproof, waterproof and resistant to many solvents. Its white opaque surface is not very aesthetic and often covered by little scratches but its mechanical properties are unequaled for a plastic. Can POM parts be laser engraved? As for metal, engraving on POM isn’t very aesthetic. It will come out as very light, sometimes barely visible. It can be used for serial numbers and post-processing marks. To learn about our POM material, you can visit our dedicated material page. When it comes the time of aesthetic objects and surfaces, we recommend using acrylic. These Plexiglas sheets are covered by foil during the laser cutting process, that protects the surface from scratches. Available in many colors from opaque to clear, acrylic is a beautiful material for decorative objects, company signs, and LED covers thanks to our diffuse acrylic. The acrylics have limited technical applications and are mostly used for decorative objects. 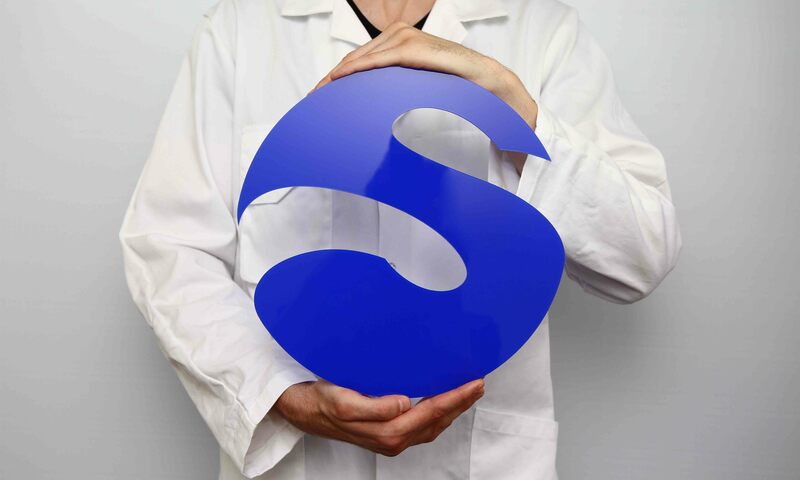 To discover the 85 acrylic possibilities (with different colors and thicknesses), please visit our material page. Laser cutting is also fitted for woods such as MDF. Medium-Density Fiberboard (MDF) is our wood engineering material. It is relatively resistant thanks to wax and a resin binder mixed with wood fibers. With laser cutting, the aspect of MDF parts is very good, especially thanks to our several color choices. The only thing to keep in mind is that the sides of the part will be burnt. Laser engraving renders fairly well on MDF, but won’t achieve the precision and beauty that you can achieve with our next material, plywood. The main application for MDF is in the furniture industry. It is often used as a structure for furniture and drawers. At Sculpteo, we used MDF to build the base of a design lamp. MDF can be used for both technical and decorative purposes but we recommend to check the material technical specificities on the material page to be sure that it fits your project. MDF is available in 7 tints (natural, black, gray, light gray, yellow, green and red) and 4 thickness up to 10 mm! You can learn more about it on our material page. Our last wood material is Plywood, available in two varieties: Poplar and Okoumé. This type of wood can serve many purposes from structure to aesthetic objects. It is often used by builders, designers or artists for its mechanical resistance (structures, buildings), its flexibility (furniture), its aesthetic beauty, its water resistance and its lightness. It is better used for decorative purposes than for technical parts. Our plywood retains its natural grain, which makes each part unique. Laser engraving renders extremely well on both our plywoods. To learn more and use plywood for your laser cutting projects, please visit our material page and upload a design! Each of these materials is used for digital printing, packaging prototypes manufacture, modelisation (shapes, drawings), and more. Cardboard is exclusively used for decorative objects as it is not weather resistant. Laser engraving renders very well on cardboard. Line engraving is so thin it looks like print. 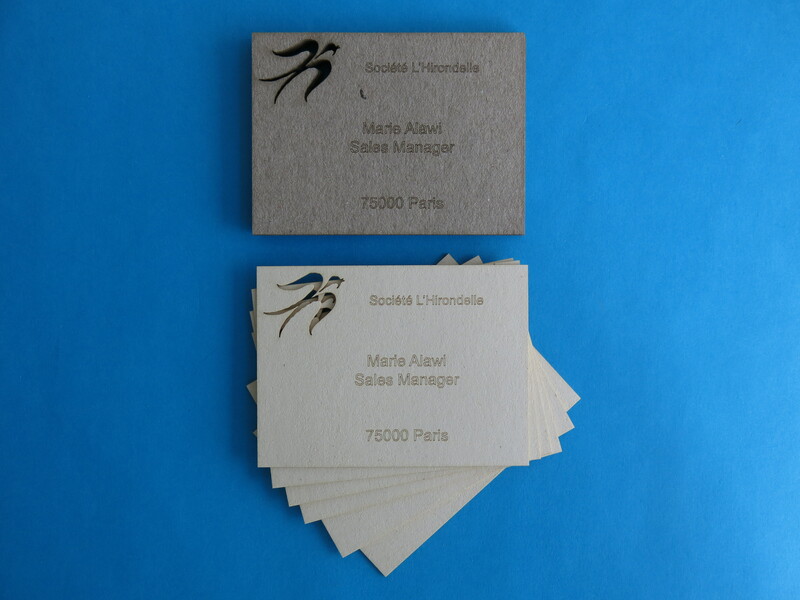 Read this article to learn how to make memorable business cards with laser cut cardboard. To learn more about our engraving service, you can visit the dedicated page on our website. 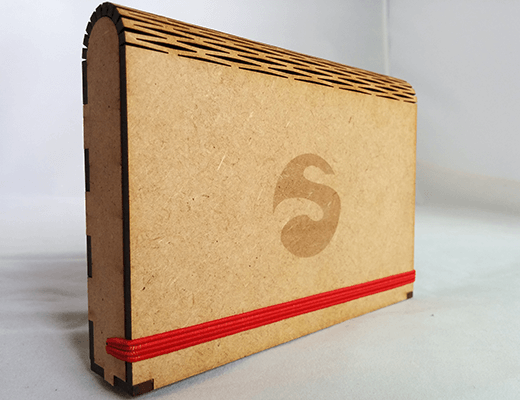 To discover all the possibilities of cardboard, please visit our material page.